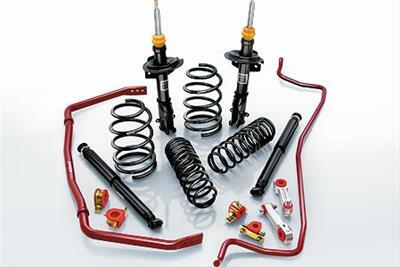 Sport Suspension Kit - Front Lowering 1.3 in; Rear Lowering 1.3 in. Bar Specs: Front Bar is 30mm, Solid, Non-Adj. / Rear Bar is 16mm,Solid, Non-Adj. The Eibach PRO-SYSTEM-PLUS adds the final step for total suspension dominance. PRO-SYSTEM-PLUS kits are designed by their team of suspension engineers and ride control experts to offer the best-possible street performance, but without sacrificing ride quality. The PRO-SYSTEM-PLUS is a precisely balanced combination of sport springs, bump-stops (secondary springs), dampers and ANTI-ROLL bars designed and tuned to operate as a complete performance suspension system. *Also available as a SPORT-SYSTEM-PLUS, which includes SPORTLINE lowering—for the lowest possible drop and over the top handling. Amount of Drop Front: 1.600 in. Amount of Drop Rear: 1.600 in.